In the 1980's, 1990's and even into the new millennium many homes were built with corner pantry closets that seemed to take up more space than they provided. Corners are often overlooked and underutilized which may help to account for the large number of builders that quickly adopted the practice of building these cumbersome closets. Anyone who has a corner pantry closet will tell you they are difficult to organize with their major advantage coming in the form of the door which shuts to hide the carnage inside. 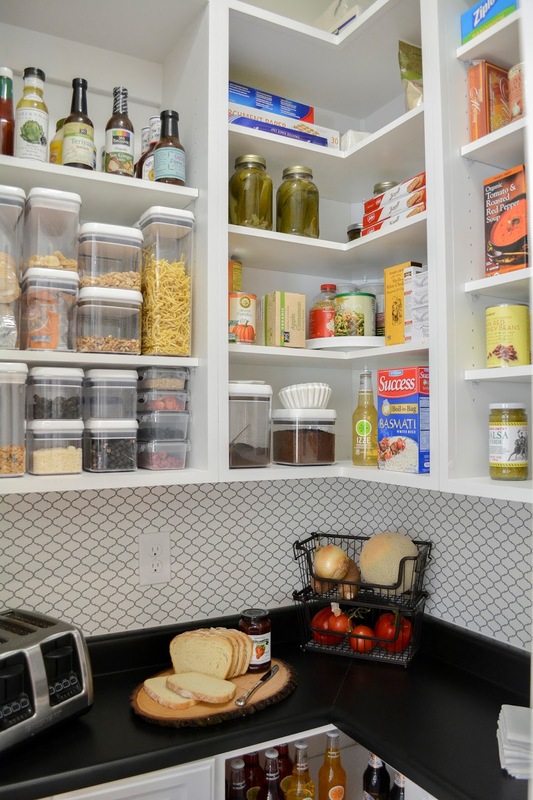 We tackled this problem in a recent renovation and wanted to share how we easily solved the organizational dilemma that is the corner pantry. First, you must remove the wire shelving that was invented by a twisted soul intent on reinventing a staple of the American home with a flimsy contraption that causes boxes to snag, bags to bust and crumbs to accumulate in an endless supply upon the floor. Half of the problem is now solved! Next, add low storage with a mix of adjustable open shelves and drawers. Top the bottom cabinets with a counter. Add adjustable wall shelving above to provide storage for large and small items alike. Finally, have some fun by adding a whimsical wall paper accent. Now instead of useless mess, you have a beautiful breakfast bar, extra prep space or simply an organized pantry. Even better, the door that seemed oh-so-important to hiding the clutter lurking within is no longer needed! 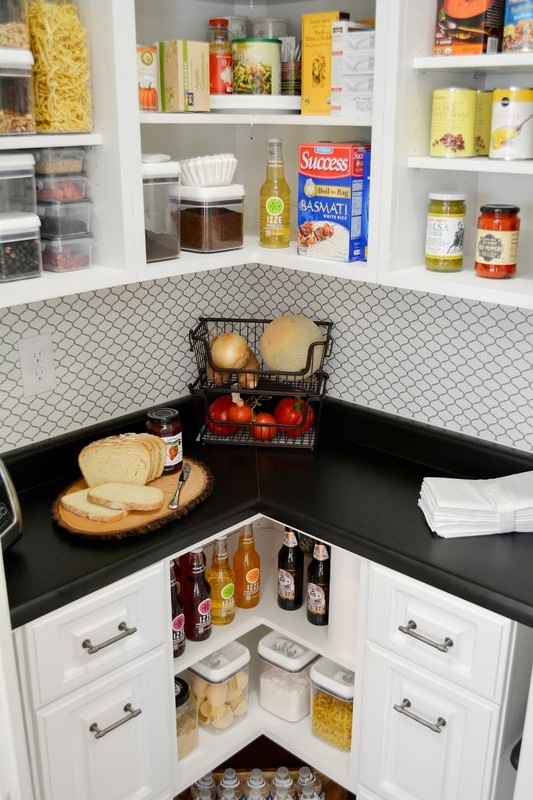 This is one corner (pantry) you would be happy to spend time in. Wow amazing transformation ! My pantry was long overdue for some organization. It had too many things out in the open and it look cluttered and chaotic. I am very please with the outcome and I hope this motivates you to organize your pantry.